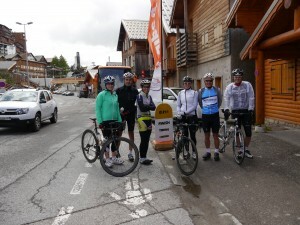 So, first ride of the week was from our doorstep, up to Villard Reculas. A beautful shallow climb of about 10km, then through the village, across the Pas du Confession which is stunning, and onto one turn of Alpe D’Huez before heading back. Nailed by all, so after a spin back down and a bit of food, we went straight into 1k run reps which was up a mountain one way, then down the other! Bit nasty, but rewarding all the same. Drinks and food at ours in the evening completed a top first day! 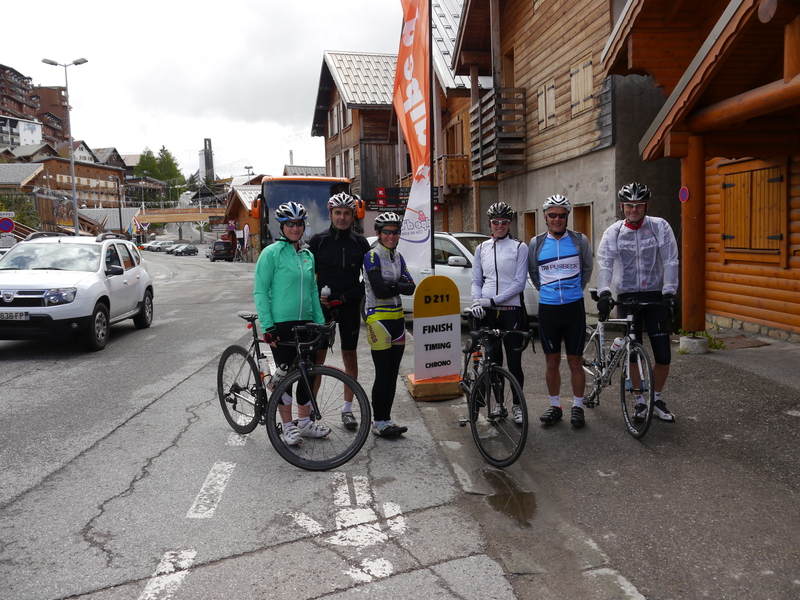 The second day, was the only drizzle / cloud we had, and to be honest it was quite welcoming as it was time to climb Alpe d’Huez. After easing out the legs with a gentle spin to Bourg D’Oisan, it was time to face the mountain! I have ridden up this beast a fair few times now, and those first few switch backs do not get any easier. However, they are the steepest so its good to get them out of the way early on! After 1-2hours of climbing, EVERY cyclist reached the top, which was a great achievement. However, the day did not stop there! After spinning back to our place via Villard, it was trainers on, and straight into a loop run up to OZ village, down to Lake Verney, then back up to Boulenguard (yep these up and downs really were mountains,) to finish with 4 x 5min, what has now been named “……the kill reps” (To find out more about these reps, please ask camp athletes!! – or come along next year and experience them for yourself ) Another great session nailed. Therefore after a bit of lunch, we headed to Lake Laffrey for a recovery OW swim! Needless to say, it certainly woke you up…Brrrrrrrrrrr – these glacier lakes are a bit chilly! They certainly had earned their Camp hoodies by this point! Mid week, and legs were beginning to feel it a bit, plus the knowledge that the BIG COL CLIMBS were looming on Thursday, Wednesday was a more chilled day, with a steady state run in the morning ( shorter for me than most due to a face plant on a manhole cover whilst crossing the dam!) followed by a swim set at Vaujany. The afternoon was free to shop, sleep, chill out, or go fishing! (Re Gary and Cheryl! – nice bit of Omega 3 for dinner!) Personally, I opted for sleep and dvds with the kiddies, in an attempt to catch up and recover a bit from Rimini! Thursday morning we woke up to blue skies and beautiful sunshine, couldn’t get much better for our long ride. After packing our sweep van with all our nutritional supplies and drink, we set off downhill for about 25k to our first col of the day. Alpe du Grand Serre is 1375m climb through trees, with lots of switch backs and stunning views. I have to say, it does go on a bit, but once you get to the top the views are amasing! This is followed by a rolling section through traditional french villages, and stunning valleys, where we met up with Ade, at Valbonnais. Quick food and drink stop, then onto col d’Ornon. I never quite know where this col starts and at 1371m its still quite a climb, made worse by its exposed nature, and it was getting hot now. A great achievement from all riders persevering to the top, to be rewarded with lunch, drinks and a break, before a fantastic descent to the bottom of the 21 turns of Alpe d’Huez! I have to say, I was really impressed how every single athlete on the camp pushed themselves on this long ride, yet were sensible enough to know which col to stop on. The wall of mountain was faced by Liz, Gary, Derek and myself, and oh, it was hot now! Gary went off at his usual break neck speed, I went up with Liz and Derek swept, with Ade in the van with support crew by this point! Liz and I took a pit stop half way up to cool off in a fountain of mountain spring – it was cold but so very refreshing! Then it was up up up! I think everyone has points on that mountain they detest, for me its turn 4 to 3 – once done, I can start to appreciate the view! Well done to everyone who made it up one, two or three of those cols, it was a tough days cycling, completed in great spirits and subsequently enjoyable. Also it was great to see the bikes coming back out of the van for the descent back to Boulengard!.. (..Next year, we will run off as well ). After showers, and a rest, it was pizza and drinks with us in the evening, a great finish to the day. So, same place / time next year? Well, also looking at a sneaky Autumn camp as well. Get some early endurance in plus some bike testing!